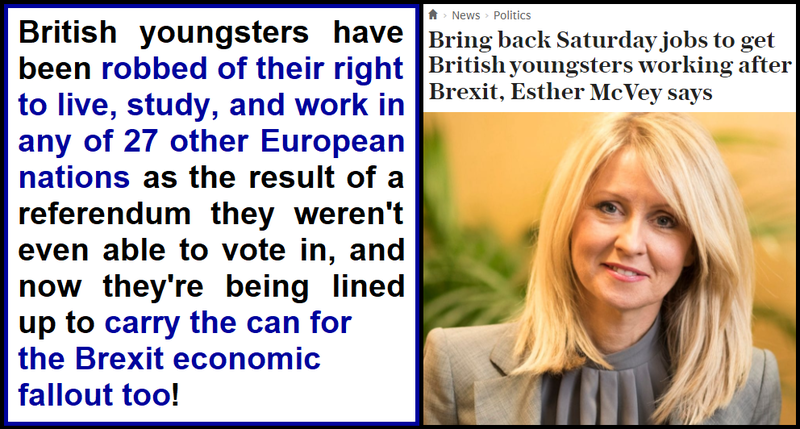 The Tory DWP minister Esther McVey has announced a bold new policy for mitigating the economic fallout from Brexit; she wants teenagers who were too young to even vote in the EU referendum to carry the can. The exodus of EU workers is already harming various sectors of the British economy including health and care services, tourism and hospitality, manufacturing, and the agricultural sector. The number of nurses coming to work in the NHS from the EU has collapsed by 90%; the hospitality industry are projecting a huge post-Brexit recruitment crisis; and £millions worth of fruit and veg are already being left to rot in British fields ... but Esther McVey thinks that the solution is to get British teenagers to plug the gaps by getting Saturday jobs! 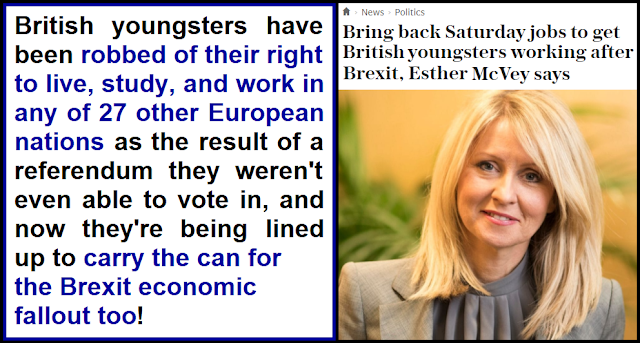 It's not just that these youngsters are being robbed of their right to live, study, and work in any of 27 other European nations as the result of a referendum they weren't even able to vote in, they're now being told by out-of-touch Tory millionaires that they should carry the can for the economic fallout of this decision too. In a way this approach does kind of make sense from a rudimentary greed-based, pro-corporate, hard-right agenda. Why should corporations pay European Union workers full minimum wage of £7.83 per hour to pick fruit and veg or work in the hospitality industry, when they could get a bunch of British teenagers in and pay them as little as £4.20 per hour? But of course it's necessary to skip over the fact that the cumulative worker-hours of a few tens of thousands more teenagers doing evening and Saturday jobs will never be able to make up the huge labour shortfall Brexit is already delivering, but since when were stuff like facts and evidence ever important to the Brextremists? It could be argued that Brexit was delivered by pensioners, so pro-Brexit pensioners rather than teenagers should be the ones to fill the gaps in the economy by picking fruit and veg or working in the hospitality industry for just £4.20 per hour. This makes a lot more sense than trying to shift the workload onto teenagers because there are far more pro-Brexit pensioners than teenagers. And anyone who believes that Britain should be aiming to become a high-skill high-tech economy must surely believe that teenagers should be concentrating on their studies, rather than picking fruit and veg for £4.20 an hour because the Brextremists chased all the migrant workers away. But the Brexit-voting pensioners obviously won't lift a finger because they'll be perfectly happy as long as all of the negative consequences of the chaotic "make it up as we go along" Tory Brexit farce are loaded onto the shoulders of the younger generations who didn't even get a vote on the issue.